Hong Kong Preparing For Bird Flu Pandemic Outbreak? 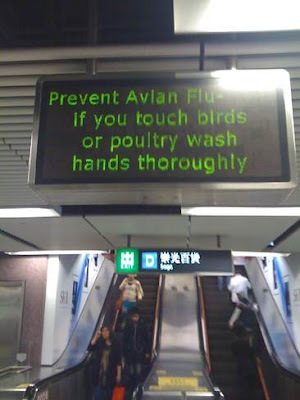 A Rense reader notes that warnings and signs of preparations to stop the spread of bird flu are all over Hong Kong right now, including electronic billboards, disinfectant and hand cleaners for the public in hotels, elevator buttons covered in plastic and cameras that can detect human fever at seaports and airports. Carcasses of chickens from bird flu-infected poultry farms outside Hong Kong have reportedly been showing up in the city's waters.